My piece in the Herald yesterday gave a shout out to various forms of urban wildlife. Among those I extolled as my favorites were pigeons. I know a lot of people don't share my fondness for them, but I think they're lovely birds. 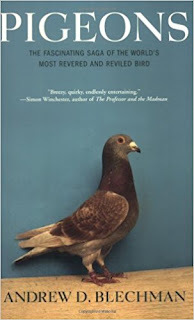 As a follow-up, I recommend the book Pigeons by Andrew D. Blechman. This is how good of a read I think it is: If you don't like pigeons now, you might be a convert after reading this fascinating account of the history of the bird. I found out things I didn't know about them; things that would have made me an admirer even I hadn't been one already. For instance, pigeons were responsible for saving thousands of human lives during times of war, via their amazing homing instincts and the carrying of messages from the battlefront, and some have been awarded their country's highest honors for bravery. As much as I like soft cuddly bunnies and such, you can't say that about rabbits. Anyway, I thought it a good idea to turn you on to the book since I enjoyed it so much. And now I have done my job and will leave you alone. P.S. For those who might like more about the book before rushing out to buy it, here's the New York Times book review. P.P.S. While the Times reviewer seems to take points away for Blechman's first-person narrative, I found it one of the more charming aspects of the book. Of course, I almost always write in the first person, so I would. We had pigeons (homing pigeons)....and we had tumbling pigeons. Most interesting creatures, they are. Grandma kept pet doves. Not nearly as smart as pigeons. I'll have to see if the library has it.